Efficient storage of a wide variety of bulky, relatively lightweight loads, including chairs, couches, desks, tables, cabinets, dressers, floor coverings, mattresses, beds, and other home furnishings. Your system must provide high accessibility to individual loads in order to facilitate quick selection of customer orders, plus have the flexibility of storage locations within the system. To minimize storage space (and construction costs) and capitalize on the higher lift height capacity of the latest handling equipment, your storage system must also be tall in height, without an overly heavy design. Your structure should be of durable construction, for low maintenance and longer service life. Cantilever-style furniture storage rack allows storage shelves without front obstructions, with solid decking covering the entire length of the rack row. The result is a system where loads of varying lengths can be placed anywhere along the entire storage shelf. Selective-type storage racks are great for mattresses and carpet. 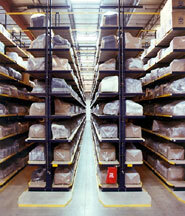 Shelf sizes of eight to twelve feet in width and depth are better suited for the longer (deeper) loads. 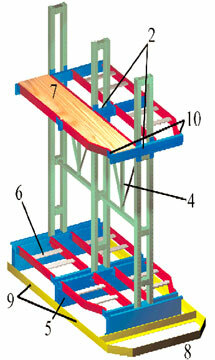 Either rack type can include optional guides for handling equipment, and can accommodate in-rack sprinklers. These storage structures are strong, durable, and yet light in weight. Contact us for prompt assistance configuring your furniture storage project. 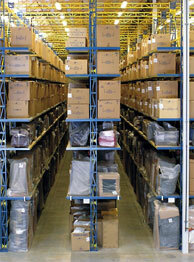 From store level to distribution center, we can help you get it right. 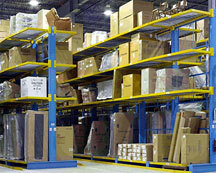 Why Cantilever Racks for Furniture Storage?